Next time you're looking to share the fun of the theater with your family, try this budget-friendly fix that brings the big screen right to your backyard. A night at the movies doesn’t come cheap. With the steep price of tickets, not to mention the popcorn and M&Ms, this classic family outing can make a big dent in a tight budget. Jessica, busy mom and blogger behind Running with Scissors, suffered from the same costly problem, but didn’t want to cut out summertime entertainment altogether. 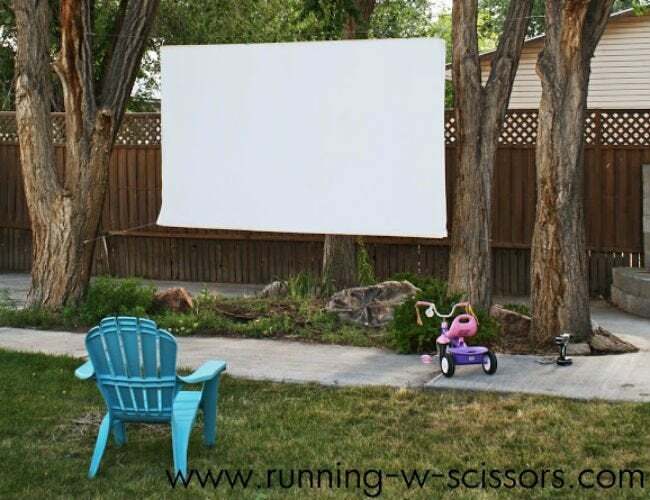 Starting with a few inexpensive items, she built an outdoor alternative—a backyard “big screen”—that was perfect for showcasing fan-favorite flicks all season long. Feeling thrifty, Jessica started on eBay, snatching up an affordable digital projector for super-sized showings. (Secondhand models in good condition are a steal online, sometimes going for as low as $10!) Next, she found herself a giant panel of screen fabric on Amazon for about $40, although an even cheaper canvas drop cloth or thick white curtain can work in a pinch. As for the stand itself, Jessica relied on what her backyard supplied: Her property featured two trees that faced each other, perfect for the job of stringing up a projector screen, hammock, or clothesline. Of course, handy homeowners looking to re-create the project, but short a pair of trees, can sub in anything sturdy and available—like a fence post or deck railing—for the screen support. After she determined the aspect ratio she wanted for her screen and what that meant for dimensions, she assembled a rectangular frame from 1×4 boards. Then Jessica stretched her fabric taut over the frame and secured it with staples—first across the top and bottom, then the sides, and finally in the corners—for a smooth, wrinkle-free viewing surface. 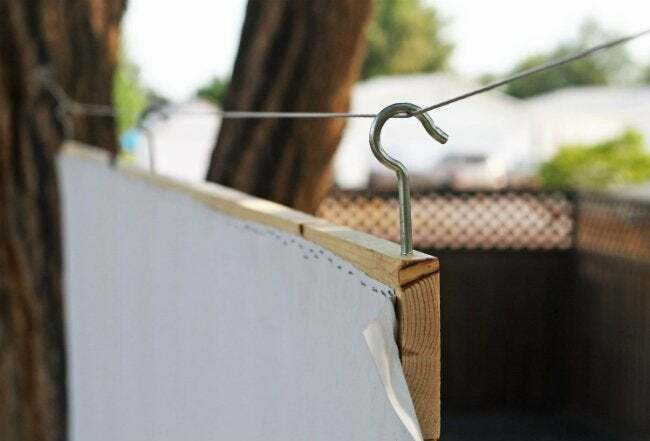 Three screw hooks fastened to the top of the lightweight frame allow it to hang from a curtain-hanging wire suspended between the two tree trunks. As an extra precaution against windy days, Jessica drilled an eye bolt into each trunk a few inches lower than the base of the screen, threaded a set of bungee cords through them, and tethered the cords to the bottom corners of the frame. Once everything was secure, Jessica went back to enjoying blockbuster entertainment, now in the comfort of her own private theater—minus the long lines and loud teenagers.